From its beautiful attractions, profuse culture and heritage, stunning landscapes, and their affordable HDBs, Singapore is indeed a place worth visiting. But what makes the land of Merlion distinct is their discernable food culture. From chaat, roti, smoked duck, lemak, and to their famous hainanese chicken, Singapore offers a unique and exquisite taste experience for locals and tourists. Moreover, satay is another Singaporean cuisine that is known to be a favorite in the country and to its Southeast Asian neighbors. Satay is a dish that consists of seasoned, skewered, and grilled meat that is usually served with sauce that can be found in hawker and food centres in Singapore. Though satay may comprise different versions such as fish or tofu satay, the dish’s is usually made up of meat products like goat, mutton, beef, and pork. 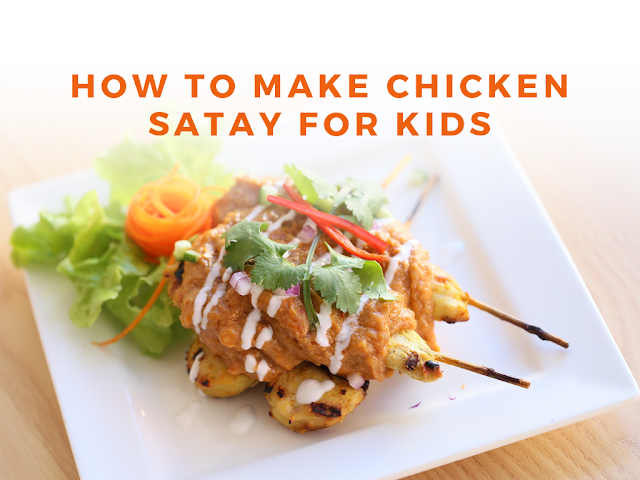 Hence, majority of the people, even kids, prefers the chicken satay style. Yes, you’ve read it right. Even your kids will love this cuisine. Now I know what you’re thinking. Is there a kid-friendly recipe for chicken satay? The answer to that question is yes. This recipe can be served to your toddlers and kids aged 1 to 4 years old! (seriously) Now that I got you all pumped up for this local favorite, keep on reading to know the steps in creating this superb dish that your kids will undoubtedly relish! 1. Mix the garlic clove, lemon juice, soy sauce, runny honey, and peanut butter together in a bowl to make the marinade. 2. Leave it for a while. 3. Proceed to flattening the chicken breast with a rolling pin. Then cut each breasts into 4 to 5 strips. 4. Place the stripped chicken into the marinade mixture. 5. Leave for 15 to 30 minutes. 6. Prepare the skewers by soaking them in cold water for 20 minutes – this will avoid the chicken from burning while it is being cooked. 7. Proceed in heating the grill. 8. Thread the chicken strips onto the wooden or bamboo skewers and grill for at least 4 minutes each side. 9. Serve with peanut dipping sauce. 1. Heat the vegetable oil in a pan. 2. Fry the onion, chillies (optional), peanut butter, coconut milk, water, and soft brown sugar for 4 minutes. 3. When fried, combine the mixture with the heated vegetable oil. 4. Boil and stir for 2 minutes until mixture is thickened. Aside from its delicious tang, this specific recipe is packed with nutrients such as folic acid, calcium, and zinc. Plus, it also provides energy, which is perfect forthe overall wellness of your kids. Remember that you can always add nutritional ingredients such as cucumber, lime wedges, and lemongrass to add more flavor to your chicken satay. Follow these simple and easy steps and it will definitely make your family meal time more fun and exciting.